As documented in The Sudbury Star, soldiers wrote home to share their stories of life on the front lines. Lost In Retreat From Mons – Turned Up Safely. Cliff Man Tells of Life on Board Warship – (Written especially for The Star by C. D. Welch, late of the U. S. Navy, now assistant Bandmaster of the Copper Cliff Reed and Brass Band). When a battleship enters into action or target practice the first operation is clearing for action. This consists of stripping the vessel of all moveable articles, rails, etc., all wooden encumbrances, such as chests and articles likely to cause danger from splinters. These fittings are left either in the navy yard or thrown overboard, according to circumstances, depending on whether the ship is in dock or at sea. Before battle the decks are spread with sand to prevent the men from slipping on the blood of the wounded or killed. A curious fact not generally know is that the gunners, before entering their turrets or manning the guns, are ordered to bathe and make a complete change of underclothing. This is done to prevent blood poisoning resulting from dirty clothes in contact with wounds which may be caused by an explosion or shell fire. The gunners enter the turrets clothed merely in a sleeveless undershirt and a pair of white duck trousers. As soon as the ship is cleared for action the bugle sounds “Man the batteries.” In an instant the ship becomes alive. The gunners enter the turrets, ammunition holsters go below, and officers man their stations on bridge, in turrets and at the range-finders, the ship, meanwhile manoeuvring to a favourable position. In The Gun Turrets – With a 12-inch gun firing is generally commenced at 18,000 yards. The officer at the main range-finder picks up the range and telephones simultaneously to the sight-setters, who wear a headpiece similar to the wireless headgear. The sight-setters behind the guns immediately set the sights, the gun is loaded and primed, and the gunners await the signal to fire. The monster guns are fired merely by the pressure of the gunners’ finger on a trigger no bigger than that of a revolver. At the signal to fire the guns speak as one, and are reloaded and reprimed ready for the next salvo, and are again brought to bear on the target. The gunners’ most dreaded enemy is the deadly backfire. This is caused by an accumulation of gas in the gun chamber, caused by the ignition of the powder, and aftertimes when the breach is opened a spark from the powder causes the gas to backfire, burning the gun crew. This danger, however, has been considerably eliminated by the recent British invention, the automatic ejector. This appliance automatically expels the gas before the breach is opened. However, even this sometimes fails, and in such cases, the gun is left in a stationary position with breach closed for half an hour in order to give any sparks of powder time to extinguish itself. Terrible Effect of Gun Fire – The terrible effect of navel gun fire may be ascertained from the fact that when the American battleship New Hampshire fired on the old obsolete Texas at target practice, her 12 inch guns ripped up the steel decks of the Texas for a distance in some cases of fourteen feet. In some parts the solid steel frame was torn up like paper. One shell went completely through the conning tower, piercing both bulkheads, consisting of eight-inch steel. This means that at 18,000 yards, a 12-inch shell pierced sixteen inches of obsolete steel armor. The life of a 12-inch gun is about 100 shots. After that number has been fired the guns must be rerifled, that is new linings must be placed in the barrels. After the New Hampshire had completed her firing she had expelled 109 shots from each of her guns. The following week she went out again to target practice and did not make a single hit. This was ample proof that her guns were completely ruined, and she was taken back to the navy yard to be rerifled. An Impressive Sight – One of the most impressive sights I ever witnessed during my service in the American navy was the gun trials of the first American dreadnought, the Delaware. At that time I was serving on the armored cruiser North Carolina, in the Atlantic fleet. We were living off the Virginian coast at manoeuvers awaiting the arrival of the Delaware, which had only been a short time in commission. At 4 o’clock in the morning the Delaware appeared on the horizon, a mere speck, no bigger than a thimble – so it appeared to us. In the early dawn she opened fire on the starboard broadside with her ten 12-inch guns. The flashes of the guns could plainly be seen through the haze and constituted a sight which one could not easily forget. As she stormed closer she became bigger and bigger, letting go with her batteries like clock work, the boom of her guns rolling along the horizon like thunder. Suddenly the dreadnought ceased firing and steamed majestically up to our squadron, making us look like rowboats in comparison. However she had nothing on my old ship in gunners, as one of our 6-inch guns held the navy prize for percentage of direct hits. Cyril McDonald Describes Fight Around Ypres – Graphic account by Copper Cliff boy of recent great battle on Flanders – work of himself and his fellow signallers – the pitiful side of war – heart-breaking scenes and incidents. “ day long on the day of April 22nd, ? of refugees from Ypres kept coming through the town of Vlamertin-? Where we were waiting for brigade ? It was a pitiable sight to see ? families, with their household goods on handcarts and bicycles; old women scarcely able to walk, and younger women with babies in their arms. And ? while the guns continued to ? and motor ambulances flashed back and forth, the wounded seeming to ? in endless streams. Early in the evening a German aeroplane ? very high, passed over the ? behind him gently floated a string of ? white puffs of smoke, while in ? beneath and all around shells burst and more white puffs floated lazily behind. We held our breath several times, thinking that surely he must come ? but still he flew on, dropping ? of lights as signals. Just as dusk commenced a string of transports, horses, refugees, soldiers on foot, but without arems, or equipment for the most part, commenced to pour through the town. All were excited and told of how the Germans had broken through northeast of Ypres, where the line was held by the Algerians. They had done this, they stated, by the use of asphyxiating gases. Some of them declared that the Germans were not more than a mile down the road, and still coming. We all had pictures of a second retreat from Mons, and went to look after our rifles. Orders were issued to ‘Stand ?” and a little later we heard that the ? and 3rd brigades had driven the Germans back at the bayonet’s point and were holding them. At 1 o’clock the order was given to ? in, and about 2 we marched off. Till ? got clear of the town we had some difficulty in avoiding the traffic, and even then we stumbled into holes and ruts every few minutes. In front and to our right every now and then a tall column of flame would lick through the smoke towards the sky, for part of Ypres was in flames. And as we progressed it gradually grew lighter, so that in bold relief against the flames and coming morn stood out the ruined steeple of Ypres Cathedral, and what was left of the once beautiful tower of the famous “Cloth Hall”. Once, as we stopped, and stops were frequent, a shell bust in a field on our right. It startled us for a moment and then there was a general laugh. Soon it was light enough to see and we came in sight of a long line of tall trees, which we afterwards found were on the edge of the Ypres Canal. We could see the vivid flash of bursting shells all along these trees and hear them bursting. The sound of the bursting shells was mingled with the sharper roar of our own artillery, and the shrieking noise of shells travelling at a high speed. Before we reached the trees all mounted men dismounted and the horses were led into a field. Orders were given for us to lay a line connecting the division Sgt. Thompson went back and Corporal Creighton and I went ahead with wire to a building situated by a bridge over the canal. Here we installed our phone in a cellar. In a short time we were in connection with the division, and also with our 1st and 4th battalions. Breakfast consisted of a few hardtack and some tea, made by one of the boys. In the meantime the order had been given for our 4th battalion to advance against the German trenches and for the 1st to follow in support. It was a beautiful day, fine and warm, and only a few fleecy clouds overhead. Shells were bursting all around and the strings of wounded began to pour in, some on stretchers and some walking, and others assisted by a comrade. The end of our house was used as a temporary dressing station, and we did what we could to assist. All were cheerful, and all told the same story of a steady advance through a hell of shell and machine gun fire, with numbers gradually diminishing. I shall never forget the sight I saw. The stretcher bearers performed prodigies all through the day. And still our fellows advanced. The toward evening we were cheered to see long lines of British advance across the canal. They were dirty and dusty and muddy; but they looked their part of “battle scarred veterans.” They went forward, and then battalion after battalion of territorials poured in as reserves. I borrowed a pair of binoculars and Lou LeLacheur, Weeks Spencer and I went forward to a point on the top of a rise, where the general and staff were, and from where the advance had started in the morning. Our attack was in conjunction with the French, and it was a fascinating sight to see them start on the advance, one line following another in extended order, and advancing by short rushes. It was more than a thousand yards of open country, and the objective was a steep ridge from which commanding position the Germans sent a merciless storm of bullets and high explosive shells. And they, not only shelled the advancing troops, but the fields, houses and roads all about; while every now and then a big ‘un Ypres bound, would pass overhead. Scarcely daring to draw a full breath, with eyes straining even through the powerful prism binoculars, I watched, those rushes ever drawing nearer to that fateful ridge. And every time a rush commenced not all would go forward, for some still, silent forms told that many had “fought the last fight”. Occasionally, one who was wounded could be seen crawling back, while regardless of life and limb, steadily coming behind, worked the heroic stretcher bearers. Once I thought that a whole bunch were wiped out, when two “Jack Johnsons” literally blotted out a field; but when the dense black smoke cleared, I saw that they had taken a left incline into a swampy hollow. Then the light grew bad, so we started to go in. We met a “Jack” carrying a pal and relieved him, and went back and carried in another wounded man. One thing I saw that night that very much impressed me was the sight of a soldier stopping behind a tree and lighting his pipe, after which he ran to catch up to the rest. I can just imagine how he appreciated that smoke. I myself lost three pipes in the crap, one of which came from a dead man’s kit. The news before we retired was most pleasing. Not only had we taken the ridge, but also the first line of German trenches. So ended the first day’s experience. Our experiences of the previous day did not prevent us all enjoying a hearty breakfast, which, Frank Kane, our famous cook, had, rising with the lark, prepared. The sun was up in all his glory, and the day gave promise of being one of activity; both Allied and German aeroplanes being continually in the air. The Germans in search of one of our batteries on our left kept us continually on the jump, with their high explosives and just before noon, one of their planes passed overhead. I remarked that we should not get a few ‘souvenirs’ our way. They moved the dressing station farther back. We were all sitting in the sun eating our dinner, when one of those vile stinking shells burst near and showered us with mud and dead pieces of iron. So we scuttled around to the front of the building and finished eating. Weeks, Lou LeLacheur and I were talking when fragments of a second shell pierced the roof of the shed in which we were standing. We moved over against the brick wall of the house, and were continuing our conversation, when we heard the rush of the third one. We all fell flat, Lou being so close to me that when I rolled over I touched him. The shell clipped the edge of the roof and burst, throwing pieces all about us. Lou rolled over on his back and started to get up, when de discovered that he was hit. A piece of the shell had pierced the big muscles of his left thigh. We carried him to the dressing station, where his wound was dressed by one of the doctors. One of the boys of the First field Ambulance from St. John has told me that he was rushed through in jig time. He is now in Cambridge Hospital, England. On my return I found we were under orders to move off at once. Taking the road towards Ypres, we went a short way and then crossed the canal by a pontoon bridge, proceeding through St. Jean and up the Wieltze road. We left the road, and by a circuitous route, through fields and woods of a handsome chateau, finally reached a group of farm buildings. Near here the 1st and 4th Brigades started to dig themselves in. Our fellows started to do likewise, while Creighton, Simms and I ran a line about half a mile to the 2nd Brigade headquarters. I can assure you we did not walk, as it was no place for a promenade. It was not dark, and we all felt the craving for a meal. We had been unable to bring anything with us except a few ‘hardtack’, but once again Frank Kane came to the rescue, and a savory smell of mutton stew – a leg of mutton and potatoes having come to light – made us double to the temporary cook house where our expectations of a good meal were fulfilled. A large, roomy lost, with plenty of straw, made a great sleeping place, but we were not long to enjoy it. At 2 a.m. orders to fall in were given. A dirty, drizzling rain was falling, and it was real chilly. We struck across the fields to the 2nd Brigade Headquarters on the Wieltze road, and from there proceeded through Wieltze and into some trenched occupied by Territorials. A line which we had laid as we came was shot to pieces before we could establish communication, so we connected across the fields to our billet of the night before, and then on to a barn, near the front trenches, where the General and staff were located. Breakfast, dinner and supper we got by taking rations from the kits we found lying about. About a hundred and fifty yards from our barn was a group of farm buildings. They were built on three sides of a square, and had evidently been abandoned in haste. The house was on fire from a shell; pigs were running around, cattle were bawling with hunger in their mangers, and a large black dog, with a pitiful and hungry look in his eyes, was chained in the centre of the yard. The pitiful side of war was here soon in all its horrors, for lying by the door was a poor fellow of the 2nd Brigade, killed by a large fragment of shell. We laid a blanket over him, and, later got permission from General Mercer to bury him. Neath a tree in the little garden of the farm we dug a grave and buried him. Staff-Captain Ware read the service and at his head we put a cross, and on his grave many flowers. That night we moved back to the canal. We had a narrow shave at the “Devil’s Elbow”, and had just passed the crossroads when the shells that destroyed the ambulances and wounded Capt. Duval came over. We were all nearly dead from want of sleep, but I had to laugh at Appleby and Weeks. We had killed a pig, and Weeks and Appleby had each a quarter impaled on fixed bayonets over their shoulders. We got about an hour’s rest at the canal, but ‘parted’ in a hurry, owing to the heated state of the atmosphere, caused by six-inch ‘souvenirs’ that the “Allemands” persisted in flinging about our place of rest. From there on we were in reserve, and save for such trifling incidents as aeroplane fights, search for spy with fixed bayonets, heavy shell fire and buildings and living in dug-outs, with one turn-out when the Germans attacked, nothing of much import happened. Note: Wording in the first part of the article was not legible. Boys Who Left Sudbury in Thick of Fighting – Are Divided Between Fourth and Fifteenth Battalions, Both of Which Figure Heavily in Casualty Lists – McKessock Saw Glover Couple of Weeks Ago and Reported All the Boys in Fine Shape – Bill Irving Laid Up With Scalded Hands. Although the casualty lists to date contain only the name of Capt. J. D. Glover, all indications point to the fact that the two companies of the 97th Regiment which left here last September were in the thick of the fighting at Ypres, in which it is now estimated the Canadians lost 2,000 in killed, wounded and missing. It is fairly well established that all of the 200 odd men who went to the front from Sudbury (some went to Bermuda) and now divided between the Fourth and Fifteenth Battalions, both of which figure heavily in the casualty lists. Just Like Being On 9th Level When Blasting Gang is Down – Copper Cliff Soldiers Write Home That Their First Trench Experience Did Not Bother Them At All – Former Bandsman Has Had Rapid Promotion At The Front. In a letter to Capt. Hambley, of No. 2 mine, Pte. J. B. Lowes, formerly a member of the 97th band, Copper Cliff, says that he and Pte. 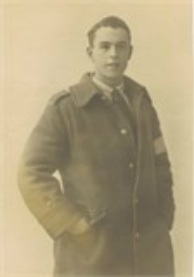 Sydney Rhodes, also a former bandsman, both had the same opinion when they first entered the trenches. It was like a duck taking to water. He says: “We both thought we were down on the 9th level when the blasting gang was down” The Copper Cliff boys are members of the second contingent, which recently arrived in France. Pte. Lowes writes his letter from the first line trenches, in which they are for the second time. He says there is a spasmodic shelling and that Pte. Rhodes is asleep in a dugout. Both are in the same company. He says the boys were given some hard work in England, but that they appreciate it now that they are on the firing line. The trenches are well made and well drained. Sgt. Follansbee Well – The boys often see Sgt. Follansbee, formerly Assit. Bandmaster in Copper Cliff. They say he is well and has had some rapid promotions although no details are given. The three former bandsmen wish to be remembered to all their former friends in Copper Cliff and also ask Capt. Hambley to convey thanks to Mr. Silvester and the Canadian Copper Co. for the respirators send and which were received in good shape. “Jimmy” Ault Writes – Pte. James Ault writes to his mother in Copper Cliff that he is well. The letter is dated October 9th, at which time the weather was very bad and getting cold. “Jimmy” wishes to be remembered to all his friends. He sees Ptes. Hanlon and Bruce quite often and they are well. Pte. Ault is with the 1st contingent, 15th battalion, 48th Highlanders, and has been through the Ypres fighting without receiving a scratch. He was laid up in a field hospital for fifteen days with a sprained ankle some time ago. Don’t Forget Copper Cliff – That the Copper Cliff boys don’t forget the old town in the first line trenches, is attested to by Pte. Tommy Burns, who writes Mr. John Anderson. Pte. Burns is with the second contingent and says that all the Copper Cliff boys of that division are well. He continues: “I am sending this straight from the first line of trenches, so you will see that shot and shell do not take Copper Cliff out of my mind.” The letter is addressed to ‘Old John’, Copper Cliff, Ontario, and came straight through to Mr. Anderson without a hitch. Cliff Boy Is Now In Egypt – “Warm Countries May Be All Right, But Give Me The Canadian Winters” He Says – Expecting Scrap Any Day Mr. Wm. Mayhew is in receipt of a letter from a former Copper Cliff boy, Pte. Bob Simmons, who, his friends will be surprised to hear, is now with the Durham Light Infantry in Egypt. Bob left Copper Cliff in November, 1914, for England, where he enlisted. He formerly worked at the sub-station at Copper Cliff and at present has a brother in Chelmsford. He has three other brothers in the same regiment as himself. After relating his training experience Pte. Simmons tells of a two wees’ water trip down through the Mediterranean. He says: “It was the roughest trip I ever had. We passed Gibraltar, were two days in Malta, one day in Alexandria and then landed and rested a few days in Port Said and spent Christmas there. It is warm here in the daytime, but very chilly at night. Although it is supposed to be winter time we have had only two or three showers since we landed. There is nothing to see but miles and miles of sand on all sides of you. There used to be a village or two where we are now but they were wiped out some time ago in a scrap, and we are expecting something of that sort to happen any time now. Pte. Burns Writes Cliff Boys Well – Jack Follansbee has been Promoted and Sid Rhodes is very Popular – All Waiting for the Word to Advance. “Give my best regards to all in the Cliff and tell them that if the Cliff boys keep up the luck they are having we will all be back with bells on” So writes Pre. Tom Burns to his brother here, after telling of an incident where their redoubt was the mark for 87 Hun shells and not a Canuck received a scratch. Cliff Boys Promoted – The letter continues: J. Follansbee has a good job here. He is Sgt.-Major Armourer. Sid Rhodes is in the trenches with us as stretcher-bearer, and there is no one more liked than Sid. If he hears of a fellow being hit you can bet your life Sid is right on the job. He was given a good name by the 19th battalion for the way he attended to two fo their men who were very badly wounded. We call him “Babe” Rhodes as he handles you as gently as he would a baby. Sudbury Officer Stumbles Across Comrade’s Grave – Lieut MacLachlan Tells of Finding of Last Resting Place of Major Norman E. Leckie – in Shady Nook Covered with Flowers – News Related in Letter. Norman Ewing ‘Tout’ Leckie was born December. 8, 1890 in Hamilton Ontario. He attended Queen’s University. His trade at enlistment was ‘Mining Engineering’, he was also a rugby star. He served one year with the 91st Canadian Highlanders and was a Major in the 58th Battalion Canadian Infantry. Norman died April 23rd, 1916. He was killed in action while on duty at Belgian Chateau near Ypres and helping to carry a wounded man into a dugout. He was instantly killed by the explosion of an enemy shell which burst in the dugout. He was buried in Perth Cemetery West Vlaanderen, Belgium. As reported in The Sudbury Star February 28th, 1917 “Lieutenant Colonel J. E. Leckie received the C.M.G. (Companion of the Order of St Michael and St George) Distinguished Service Medal in France”. Tells of Battle When Wounded – Vivid description of action in which Canadians took German trench – Bullet passed through helmet and another through his arm – Will go back. Robert Bell was born June 27, 1893 in Kenton England. His parents were Mr. and Mrs. Thomas Bell of Copper Cliff. Robert 'Bob' enlisted with the Algonquin Rifles. His trade at enlistment was ‘Electrician’. He transferred to the 37th Battalion. Bob went to France with the 43rd Cameron Highlanders and was at the Somme. He was severely wounded and received treatment in seven different hospitals in England. He transferred to the Canadian Engineers and after four year away returned to the Electrical Department of the International Nickel Company. Michael John Quinn was born June 6, 1886 in Belfast Ireland. His trade was Machinist at enlistment. He was employed by the Canadian Copper Company as a Hoistman. He served with the 119th Overseas Battalion, 97th Regiment. Michael was killed in action on August 24, 1917 in the trenches north of Lens. He was a Private with the Canadian Infantry 52nd Battalion. Michael was buries at Aix-Noulette Communal Cemetery Extension, Pas de Calais, France. His name is on a memorial plaque in St. Stanislaus Church, Copper Cliff.